This environmental friendly wooden Double Sided Domino is made of wood from FSC-monitored source, painted with water-based paints, packaged in a box made of recycled materials, and printed with soy-bean ink. 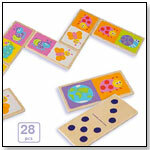 It's designed for preschoolers to learn numbers, counting and matching, plus develop motor and cognitive skills. The pieces can be stored in the sturdy drawer box that comes with the toy. It's been tested to meet European and U.S. safety standards.